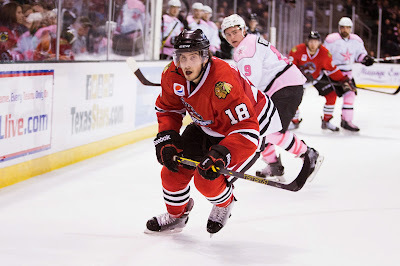 Phillip Danault had a natural hat trick for Rockford, all in the third. Putting it simply, Coach Laxdal had the assessment of the Stars' Saturday night effort. "If you go back and reflect on the game, I think they outplayed us start to finish. I don't think we deserved to win tonight." It's not like Texas didn't have chances for the victory. Up 3-2 after two periods, Texas dropped a winnable game by allowing four goals in the final frame. "We're up going into the third period and we have to find a way to close it out," said Kevin Henderson. "This is a team we need to catch. Being at home, we have to find a way to win." Texas and Rockford swapped goals in the second period with each club getting an even strength and a power play tally. The Stars saw Justin Dowling score on a one-timer and Kevin Henderson tally his second of the year to make it 2-2 late in the frame. Travis Morin found himself uncovered in the right wing circle and Gemel Smith feathered a pass over to him for the one-time bid that made it 3-2. The Stars would start the third on two near-consecutive power plays but couldn't cash in on either. Laxdal assessed, "They're a physical team and we aren't built to be a big heavy team. They're going to take penalties and we have to take advantage of that." Greg Rallo and Cameron Gaunce found themselves in the box just after the stars PP and Rockford as able to take advantage of that chance. Laxdal thought the Gaunce cross-checking minor was a soft one, but it made it 5-on-3 for Rockford for 84 seconds nonetheless. Garrett Ross scored for the Hogs to tie the game on the two-man advantage. Then the game became The Phillip Danault Show. Coming off a Texas power play, Danault stormed down the ice with Rockford and potted his first of the night. Two minutes later, it was 5-3 thanks to Danault again. He finished the hat trick into the empty net four minutes later. The Stars tried valiantly to get back into the game after ceding the fifth goal, pulling Campbell with over three minutes left in the frame. Campbell, who started his second game in as many nights this evening, took the loss with 35 saves on 40 shots. He didn't look great, but really this was a team failure more than it could be pinned on any one player. Texas has a full five days off before their next game against Iowa. Texas lost Scott Glennie after an awkward fall in the first period. Kevin Henderson and Eric Faille each scored their first of the season, in Faille's case the first AHL goal of his career, to push Texas past the Toronto Marlies. The Stars finish the season with a 3-0-1 record against the Marlies. Scott Glennie contributed the game-winning goal, his fourth point in the past three games and first game-winner on the season. Jussi Rynnas almost had the shutout, but he got the win and that's pretty important too. Rynnas is white hot in February. He's got a 5-2 record with a .942 SV% and 1.72 GAA. The two losses came against the top two teams in the conference, OKC and Utica. The win puts Texas in seventh place for now with more Western Conference games to be played this evening. Two goals in the opening minutes of the third period and another strong performance in net by Jussi Rynnas propelled the Texas Stars to a 3-1 win over the Toronto Marlies in the regular season finale between the two clubs in front 5,183 fans on Saturday afternoon at Ricoh Coliseum. Scott Glennie and Eric Faille each scored in the opening 4:29 of the third to open up a 3-0 lead for the Stars. 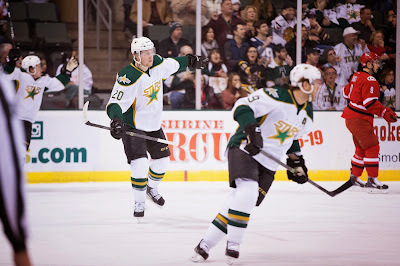 Faille's goal was the first of his AHL career, and came after he was initially credited with the Stars' opening goal, but credit was changed to Kevin Henderson. Rynnas stopped 31 of 32 shots for his 18th win of year, and was less than two minutes away from his fifth shutout of the season before Toronto (21-21-9-0) scored their lone goal with 1:37 remaining. Texas (25-17-10-1) closes out their six-game road trip on Tuesday, when they visit the Oklahoma City Barons for the final matchup ever between the two clubs as the Barons will relocate the AHL's new Pacific Division next year in Bakersfield, Cali. Texas opened up the scoring as Henderson tipped home his first goal of the season off Jamie Oleksiak's point shot at 11:59 of the first. The offense remained quiet in period two as both Rynnas and Toronto's Christopher Gibson went save-for-save with Rynnas turning aside 13 shots from the Marlies. Gibson stopped 11, and took the loss with 29 saves overall in the game. With a power play early in the third, Gemel Smith fed Glennie for his seventh of the season on a backdoor pass to make it a 2-0 lead for Texas at 3:54. 35 seconds later, Faille buried his first of the year off a turnover in the right circle of the offensive zone by crossing the front of the net to drag Gibson out of position for an easy tap in. Matt Mangene also tallied an assist on Glennie's goal. The Texas special team's units continued their strong play finishing 1-for-2 on the power play and scoring a man-advantage goal for the 14th time in their last 18 games. The Stars killed off all three Toronto power plays, and have been perfect on the penalty kill in 17 of their last 18 road contests. Rynnas improved his record to 5-1-0 over his last six games, giving up two goals or less in five of those matchups. 25 of his 31 saves in the game came in the final two periods. Texas is now 4-1-0-0 on their road trip and has won six of their last eight games. Utica's at the top of the standings for a reason. 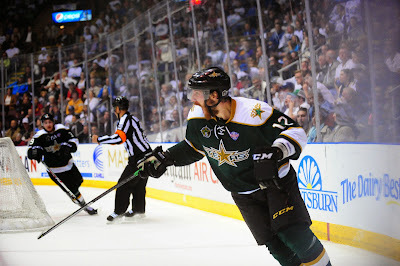 They showed why tonight with a 5-2 browbeating of the Texas Stars in upstate New York. The Stars were neck-and-neck with the Comets early but a goal by Dustin Jeffrey in the last minute of the first put Utica on a path to victory. Texas didn't help their own case by allowing goals in the first minute of both the first and second period. A pair of power play goals by the Utica Comets was the difference on Wednesday night as the Texas Stars’ three-game winning streak came to an end in a 5-2 loss at Utica Memorial Auditorium. Former Star Dustin Jeffrey struck late in the first period to give Utica a 2-1 lead on the power play, and Brendan Gaunce also scored on the man-advantage midway through the second to extend it to a three goal cushion and pull the Comets (30-14-5-1) away for good in the Texas loss. It was the first time in 15 road games the Stars had given up a power play goal, as they entered the game as the AHL's top penalty killing team away from home. Jesse Root and Derek Meech each scored for Texas (23-17-10-1). Jussi Rynnas suffered just his second regulation loss in the last 10 games, stopping 20 of 24 Utica shots. In his only appearance against the Stars this season, Jacob Markstrom turned aside 24 of 26 shots to earn the win. The Dallas Stars announced this afternoon that Brendan Ranford has been recalled to the Dallas Stars. Ranford signed a three-year entry level deal with Dallas this past summer. This will be the first NHL recall of his career, which began on a PTO to the Texas Stars last season. 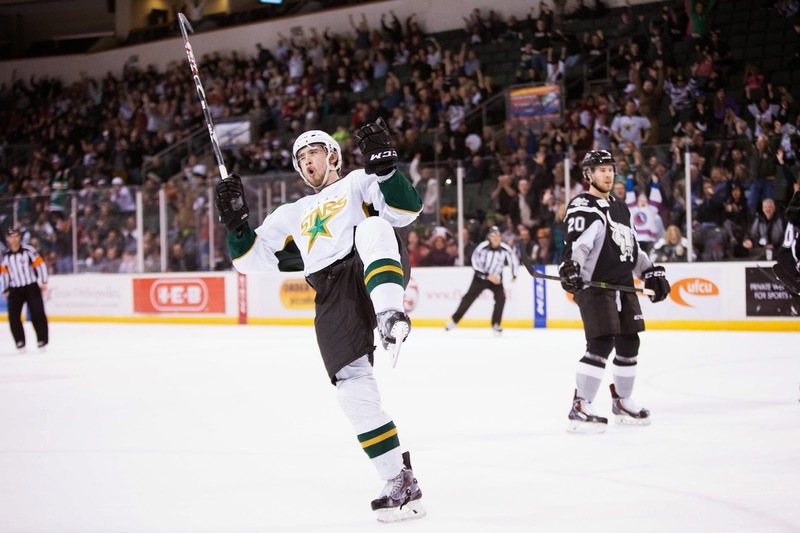 After the young winger proved himself to be extremely valuable on the top line with Curtis McKenzie and Travis Morin in the Calder Cup run, he got a contract from Dallas on July 2nd of last year. Texas has enough skaters in Utica to ice a full lineup tonight. Depending on the health of Scott Glennie and Maxime Fortunus, they may have some scratches as well. Dallas Stars General Manager Jim Nill announced today that the club has recalled forward Brendan Ranford from the Texas Stars, Dallas' top development affiliate in the American Hockey League (AHL). 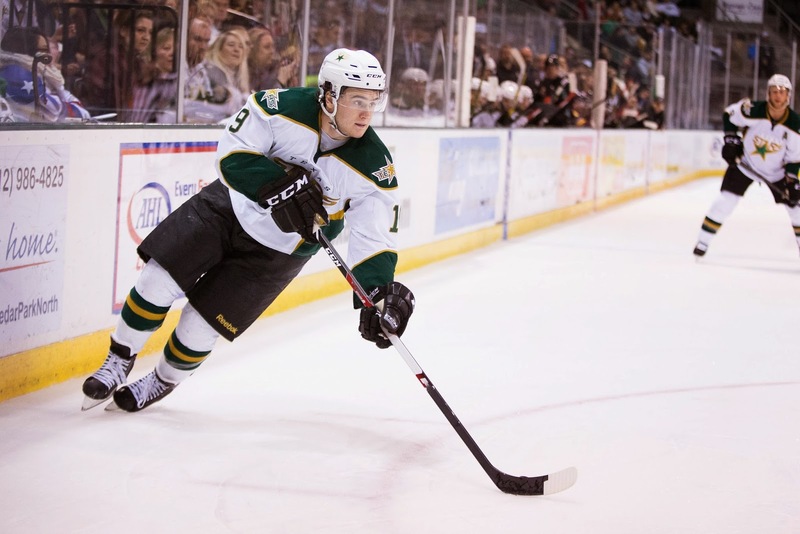 Ranford, 22, currently ranks second on Texas with 23 assists and 36 points (13-23=36), while he ranks third on the squad with 13 goals in 50 games this season. The 5-foot-10, 190-pound native of Edmonton, Alta. was originally selected by Philadelphia in the seventh round (209th overall) of the 2010 NHL Draft, and was signed by Dallas as a free agent on July 2, 2014. Nill also announced today that the club has placed forward Travis Moen on Injured Reserve (upper body), retroactive to Feb. 17. Moen has recorded six points (1-5=6) in 30 games with Dallas this season. 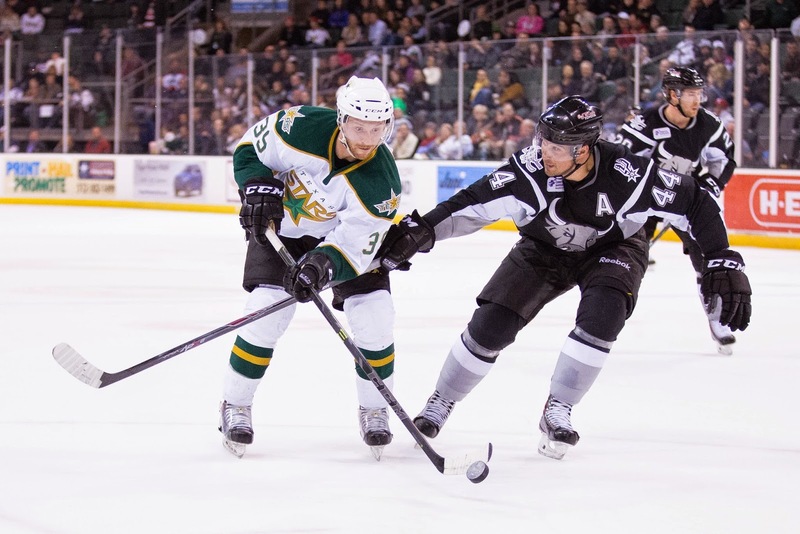 The Idaho Steelheads just completed a three-game series against the Utah Grizzlies in which the Grizzlies were able to take two out of the three games. The meaning of these three games in the overall grand scheme of the playoffs meant more for Utah trying to get into a playoff position versus Idaho, which currently has a nine point lead over Utah in 4th place and an 11 point lead over 5th place Alaska Aces. Of course at this point I have buried the lead. 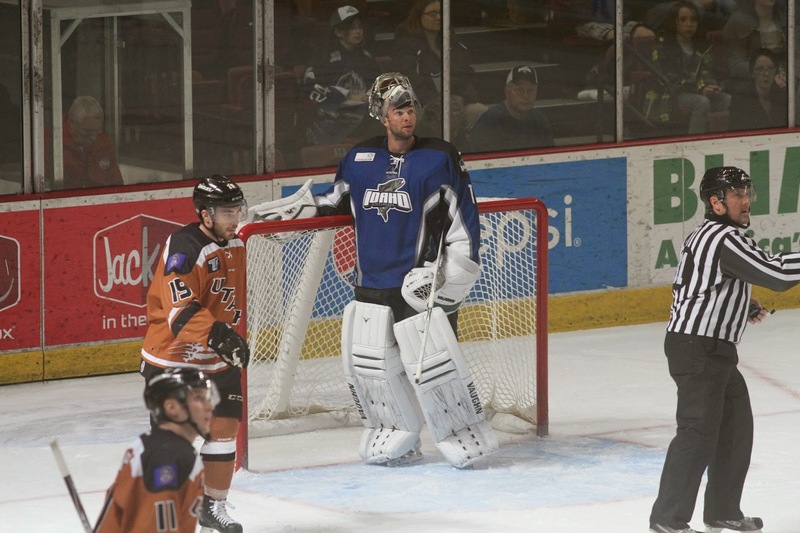 This past week the Idaho Steelheads were assigned Dallas prospect and Texas backup goaltender Jack Campbell. It is assumed that the assignment will be no longer than a couple of weeks (up to nine games played) before he gets recalled to Texas after having worked off some rust down in the ECHL. I was given the charge this past weekend to get a good look at the 6’ 3” 195 lb. prospect and give a review of his performance over the two home games played this past weekend. This was the first game that Idaho played in over a week, and there was a bit of evidence of that during the game. The entire team was just a bit loose with regards to their systems, and it ended up forcing Campbell to make a few extra saves, as well as force him to do some scrambling around his net. When all was said and done, Campbell made 24 save on 27 shots. Despite getting tagged with the loss, Campbell played well. In the game, Idaho jumped out to a 2-0 lead on the strength of two power play goals, but just as quickly as the power play gave the power play took away. Both of the goals that Utah scored to tie the game up came on shorthanded breakaways. There was an apparent holding call missed on the first goal and the second one was a breakaway from the penalty box as the player came out behind the Steelheads for the goal. The game-winning goal was a product of right place right time for Utah as the Steelheads broke up the initial rush, but the bouncing puck went right to a Grizzlies stick and a quick release through traffic later, Campbell had no chance to make the save. I think if Campbell had another game or two under his belt, maybe he comes up with a save on one of the breakaway goals, but as Patrick Cullity told me postgame, there were team breakdowns that led to the Utah goals, and shouldn’t be pinned on any individual. I think if you add in the fact that the team had not played for over a week and Campbell hadn’t played meaningful minutes in what must seem like forever, it wasn’t a bad first outing. 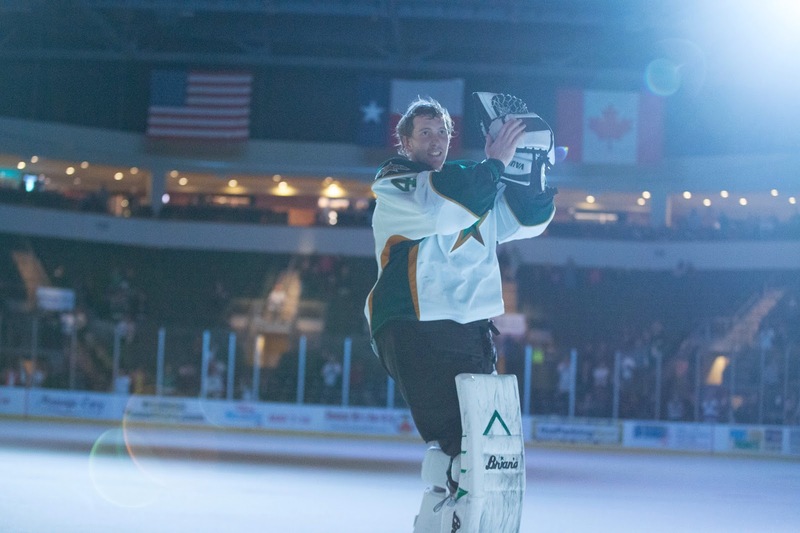 Jack Campbell earned his first ECHL win in his second start and earned the 3rd star of the night for his efforts. Campbell ended the night making 22 saves on 23 shots including a clean breakaway in the second period with the game tied at one. Gaelan Patterson and Colton Beck took care of the game winners and insurance goals to help earn the win for Idaho. Campbell played as well on Saturday as he did on Friday. The big difference was the team in front of him. Forwards were back-checking harder on Saturday. The defensemen were doing a better job of clearing the crease of players and rebounds. The chances that Utah got were of lesser quality. The lone goal came off a clean face-off win in the offensive zone and a shot from the point that found its way through about five players and may have been deflected on the way in. Campbell looked calm and collected the entire night, never seemed out of control and if there was any rust leftover from the time off, it was entirely gone by the end of the first period on Saturday. The Steelheads did travel down to Utah for the third game of the set and Idaho did lose the game 2-0. Didn’t get to see the game, did listen to Will Hoenike on the call and at least one of the goals allowed was a total defensive breakdown that left Campbell out to dry. Of course when a team doesn’t score any goals, it’s awfully hard to win. So here’s the conclusion from the weekend. First, the Idaho Steelheads are fine even after losing two out of three. They are still solidly in a playoff position and they are starting to get back into the everyday grind of hockey. Nobody on the team will use the layoff as an excuse, but when you don’t have a game for nine days, it affects your body and not always in a great way. But with the grind of the schedule picking back up, I expect the team will be fine going forward. As for Jack Campbell, I think there are still some things that could be better, however, as a 23 year old, he has plenty of time to work those out of his game. For the three games played this weekend, he has a 1-2 record with a 2.04 GAA and a .919 save percentage. The goals against average and the save percentage are outstanding, and if those numbers hold true for the remainder of his time in the ECHL, not only will the Steelheads win a bunch of games while he is here, but I would consider it mission accomplished as far as the organizational goal of getting him quality playing time goes. Stay tuned later this month for the regular Steelheads update. 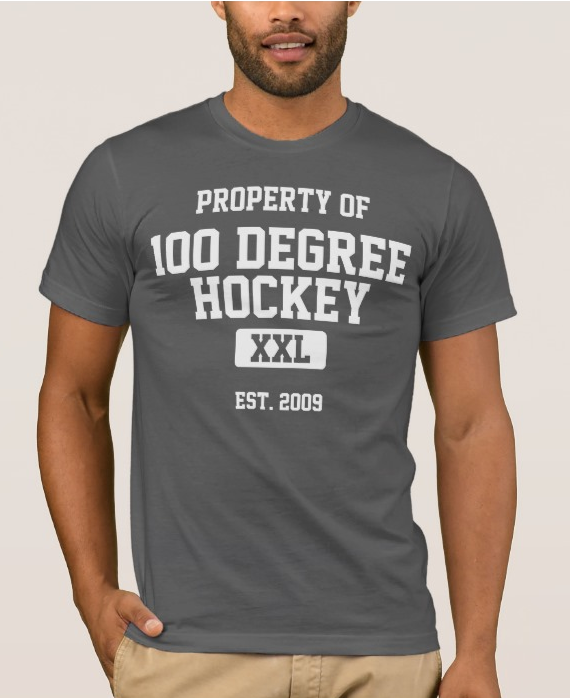 John Mulhern covers the Idaho Steelheads for 100 Degree Hockey. In Boise, Mulhern works as on-air talent for the Steelheads broadcast team on KTIK Boise. You can check out his podcast at Two Sports Nuts. Jussi Rynnas picked up AHL Player of the Week honors this week after a 3-0-0 performance, including one shutout, last week. Rynnas has been key to cleaning up occasionally messy situations that could have put Texas behind the eight ball this season. It's pretty impressive to consider that Rynnas probably wasn't the only Star who could have been named as PotW. Greg Rallo had four goals and an assist this week. The team is clicking. Utica is going to be a fun game. 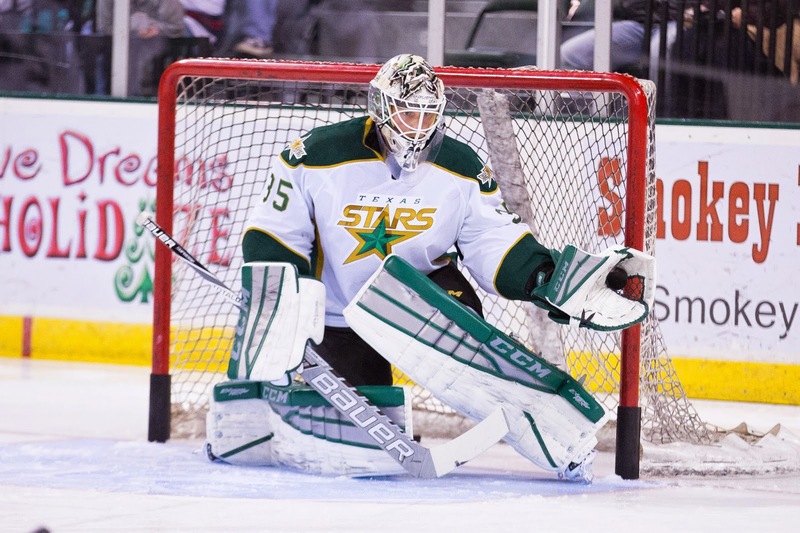 The American Hockey League announced today that Texas Stars goaltender Jussi Rynnas has been selected as the CCM/AHL Player of the Week for the period ending Feb. 15, 2015. Rynnas stopped 89 of 91 shots in three starts last week, posting a 3-0-0 record, a 0.67 goals-against average and a .978 save percentage. On Tuesday night, Rynnas made 28 saves as Texas rolled past San Antonio, 6-1. He took a shutout bid into the final minute of regulation on Friday night and finished with 35 saves in a 3-1 win at Iowa, then came back on Saturday and earned his fourth shutout of the season with a 26-save effort in a 2-0 victory over the Wild. In 28 appearances with Texas this season, Rynnas has a record of 16-4-6 with a 2.46 goals-against average, a .921 save percentage and four shutouts. The 27-year-old native of Pori, Finland, signed as a free agent with the Dallas Stars on July 7, 2014, after leading all Liiga (Finnish Elite League) goaltenders in GAA and save percentage and winning a championship with Karpat last season. 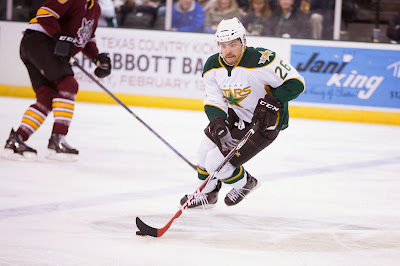 Rynnas has played 101 career AHL games with Texas and Toronto as well as five National Hockey League contests, including two this season with Dallas. In recognition of his achievement, Rynnas will be presented with an etched crystal award prior to an upcoming Stars home game. Needing four points to get themselves into prime position in the playoff race, Texas got those points and some big-time added confidence thanks to really solid goaltending from Jussi Rynnas. Rynnas' shutout was his fourth of the year. Greg Rallo also stayed hot with a goal in five straight games now. Texas is still in 8th place but has a three point cushion on Adirondack, which is spiraling out of control at 3-6-1-0 in their last ten. 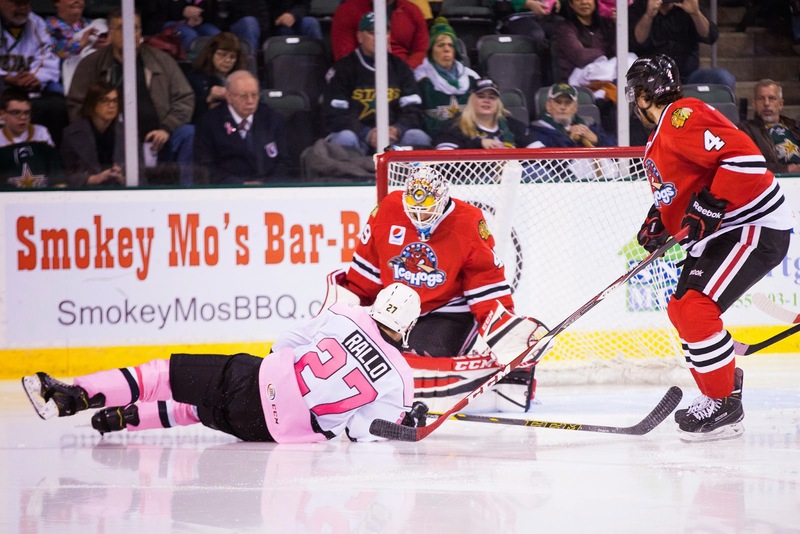 Jussi Rynnas was perfect in net and Greg Rallo continued his scoring binge to lead the Texas Stars to their fourth shutout of the season in a 2-0 win over the Iowa Wild on Satuday night at Wells Fargo Arena in front of 9,107 in attendance. Rynnas stopped 26 shots for his fourth shutout and 16th win of the year. Greg Rallo's first period goal held up as the game-winner and extended the veteran forward's goal-scoring streak to five games. Rallo has tallied six goals and eight points overall during the stretch. Rynnas has given up just a pair of goals over his last three stars, and has won six of his last eight for Texas. Texas (23-16-10-1) continues their season-long road trip on Wednesday, when they visit Utica at 6 p.m.
Rallo buried Derek Hulak's crossing pass from the right circle at 10:06 of the first for his 17th of the season, and third goal in two games against Iowa (17-33-1-1). After a scoreless second, Brendan Ranford kept the Stars power play unit clicking with a wrist shot at 12:30 of the third from the right circle that banked off the crossbar for his 13th of the season. The Stars finished 1-for-3 on the power play and have scored a man-advantage goal in 12 of their last 15 contests. Texas also continued their strong penalty killing on the road, holding the Wild scoreless in six power play chances. Matt Mangene recorded the assist on Ranford's goal. Iowa's Johan Gustafsson took the loss, going 18 of 20 in net. UPDATE: Brett Ritchie and Travis Morin have been recalled to Dallas. Jesse Root has been recalled to Texas from Boise as well. Same teams and Texas is hoping for the same result. Two points tonight would be a pretty big feat though. Texas is likely to lose at least two players today thanks to last night's Dallas game. Ales Hemsky, Tyler Seguin and Patrick Eaves all left the game with injuries. Brett Ritchie is a likely callup. Justin Dowling might be as well. Travis Morin would be, but he's got the waiver limit just one game away. Stay tuned through the day for more callup information. The Wathier family has maintained close connections to people they've met throughout Francis' long career. That includes Karen Bougher, an Iowa fan who "rarely misses a hockey game," that the Wathiers met during their four years in Des Moines. Bougher was diagnosed with breast cancer and had to undergo a double mastectomy in December. She is currently in the midst of multiple chemotherapy sessions that began on January 27th. Karen decided to shave her head in advance of her second chemotherapy treatment yesterday. Former Star Francis Wathier joined Karen from Portland, Maine, via video chat and shaved his head as well in a showing of solidarity. His wife, Isabel, filmed the event while two of his children helped him out with the task. You can learn more about Karen's fight here. Texas will host its 6th Annual Pink in the Rink night when Texas returns to the CPC on February 27th and 28th. The Anders Lindback experiment in Dallas is over as GM Jim Nill traded Lindback and a conditional third round pick to Buffalo for goalie Jhonas Enroth. Enroth has been playing all season with Buffalo, getting into 37 NHL games as opposed to Lindback's 10. 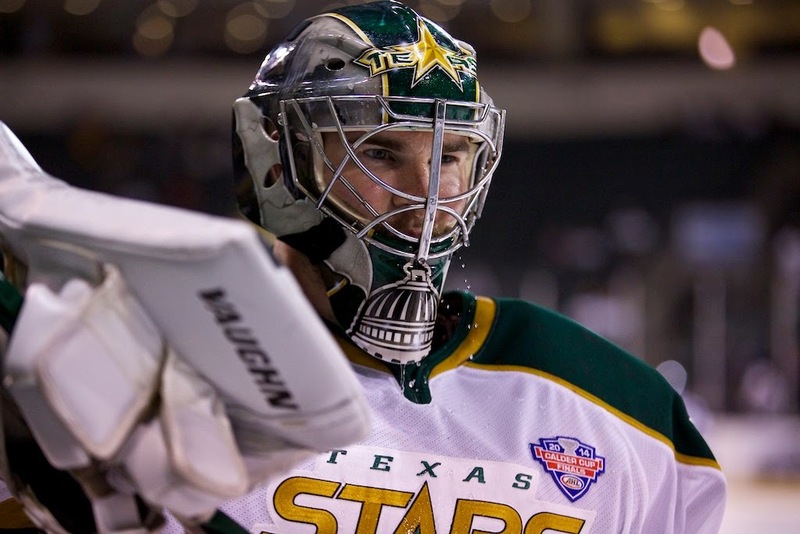 The trade likely means that Jussi Rynnas is the solidified starter for the Texas Stars the rest of the season. Brett Ritchie has been reassigned to the Texas Stars as they prepare to leave for a six-game road trip, their longest of the season. The Texas Stars, American Hockey League affiliate of the NHL’s Dallas Stars, announced today forward Brett Ritchie has been reassigned to the team from Dallas. Ritchie, 21, has posted four points (three goals, one assist) and a +2 plus/minus rating in 10 NHL games with Dallas this season. He scored his first career NHL goal in his first career NHL game on his first shot on Dec. 31, 2014 vs. the Arizona Coyotes. In 23 games with Texas, he has posted 18 points (11 goals, seven assists) and a team-leading +10 plus/minus rating. The tone of tonight's game could be determined off the first puck drop. Last time these two teams met, it got a little heated. Coach Laxdal got into a heated argument with San Antonio's Coach Rowe. The time before that Shane O'Brien tried to take down anyone he could at the end of overtime, attempting to draw either Cameron Gaunce or Maxime Fortunus into a brawl. Neither incident drew any supplemental justice. It appears these teams will try to settle things between themselves in the Lone Star state. So I would listen closely when Rob Mason announces tonight's starting lineup for the San Antonio Rampage. Tom Rowe has to make the first move, sending in his lineup first. If you see some of the punchers out there, like Shane O'Brien particularly, get ready for something interesting off the drop. As to the game at hand, the Rampage are doing pretty well points-wise. After beating Texas in the shootout, the Rampage beat OKC 5-3, scoring three straight to roar back from a 3-2 deficit in front of a home crowd of over 13,000. Dan Ellis is 21-8-2 on the season and is feasting on Texas. At 6-1 with a 2.09 GAA and .929 SV% against his former organization, Ellis is the ace in the hole of the I-35 rivalry. On the Texas side, Jussi Rynnas is your man in net. He's yet to lose to San Antonio in regulation, but it's a small sample size. Jack Campbell is 0-4 against the Rampage this season; Rynnas is 1-0-1. The Stars' sluggish start put them in a 3-1 hole after forty from which they would not recover. Despite a third period power play tally, Texas dropped a 3-2 decision to the visiting Barons. "We've been pushing real strong on this segment," said Coach Laxdal. "But we came out flat tonight. We expected our group to have some good jump in the first period, but we didn't get our legs until the third period. Texas and Oklahoma City had a sleepy start to the game, combining for just four shots in the first twelve minutes of the game. "We were sluggish to begin the game," agreed Rallo. "Moving forward, we got better, but that's not good enough at this level." Having not played since Thursday and getting Friday and Saturday off, the Stars' start was not ideal. Laxdal added, "A typical Sunday game in the American League. I expected our team to have more energy than Oklahoma City. We didn't find our game until the third period and by theyn, it was too late." "I didn't think Jussi [Rynnas] was sharp. Of the three goals, we should have had two of the three. Every game is tough for us. Every point we let go is going to hurt us at the end." Tonight's game marked the final visit for the Oklahoma City squad, which is heading to Bakersfield, California next season. The Barons opened the scoring in the final 80 seconds of the first period. Andrew Miller was left all alone in front of the net and potted his 16th of the year. 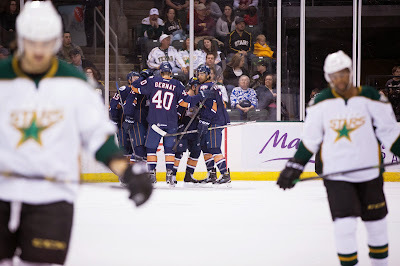 It appeared that Texas would head to the room down 1-0 until Derek Hulak beat Laurent Brossoit just 38 seconds later. It was Hulak's 12th of the year and continues his hot 2015 campaign. He's scored 13 points since the new year began. The second period was all OKC. Taylor Peters went to the box after seeing his stick ride up into the face of a Baron on the backcheck. On the ensuing faceoff, Brad Hunt put a puck off Stars' D Derek Meech and into the net through the pads of Rynnas. Late in the frame, the Stars were guilty of a bad change, leaving Jujhar Khaira rushing in on a 2-on-1 against Rynnas. He snapped the puck far side and in as Maxime Fortunus defended the pass. The Stars began the third period on the power play, and Greg Rallo cashed in. Meech's point shot tipped off Rallo's stick to the top-right corner for the 3-2 score. "It's something we talked about, getting pucks to the net. Meech and I have practiced that a bit, finding that spot where he shoots for my stick, and I get it to the net. Tonight it worked out well." Brossoit got lucky as much as he was good in the third. He got a fraction of a glove on a point-bank chance from Gemel Smith, another from Derek Hulak and a third from Julius Honka as the period wore on. Late in the game, Texas attempted to gain the equalizer, earning a faceoff in the Barons' zone with 1:47 left in the third. The Stars won the faceoff and had pressure but did not pull Jussi Rynnas until just under 60 seconds remaining. Rynnas was ready to come off at 1:40 but was held back with the extended hand of Derek Laxdal. The Stars got another faceoff with 19.2 left but could not pull out the tying goal. Texas stays in town to face San Antonio on Tuesday. UPDATE: Brett Ritchie has been recalled to Dallas. 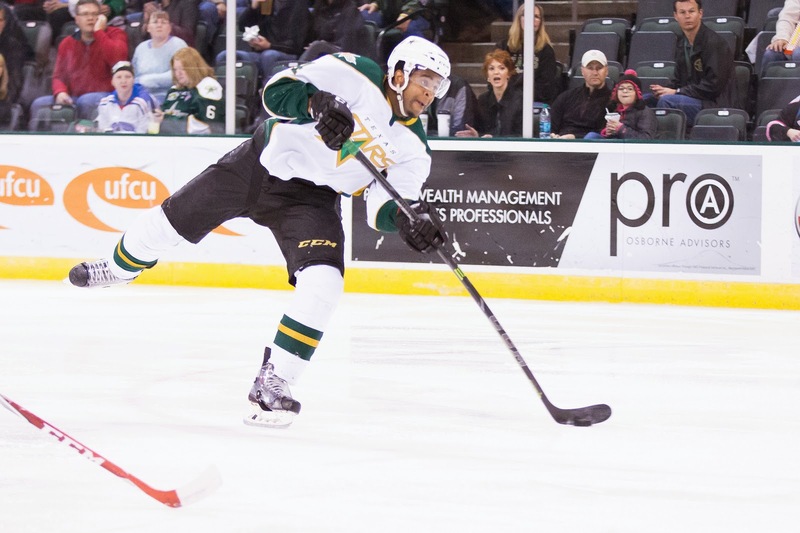 With Jesse Root in Idaho, Texas will likely dress a defenseman at forward. San Antonio again. With Tuesday's loss, the Stars dropped to 1-4-1-1 against the Rampage this season and have now started the back-half of their schedule against the San Antonio squad. With tonight's game, two of the next three come against them. It's at least a little unclear what there is to say about this matchup at this point. Texas has had success jumping on San Antonio early but has gotten taken down in the late stage of many of those same games, as was the case on Tuesday. Texas had 1-0 and 2-1 leads and lost 3-2 in their first shootout. Anders Lindback's play will be one huge thing to watch. Dallas is looking to get him back in a rhythm with some starts. He got 40 of 42 saves in regulation and OT on Tuesday and gave up two in the shootout. However, all four goals were scored the same way: five-hole. Lindback was none too pleased, cracking his stick on the dashers as he left the ice Tuesday. Will San Antonio go back to the well on that move tonight? Looking to turn a good homestand into a great one, Texas got just this close, falling in their first shootout of the season. The Stars collected eight of ten possible points in the five game set that spanned the All-Star Break and was very heavy on divisional opponents. "We're selfish and want to get ten," said Laxdal, after admitting eight was good. "We have to battle for points. We're getting close to that [playoff] line, but it shows you how tough it is get over the line because everybody wins." Texas was up 2-1 after forty and had a great chance at earning both points. Rocco Grimaldi helped to spur a comeback for San Antonio with the game-tying goal in the third period and the winner in the shootout for the 3-2 final. The Stars managed to make it through overtime without any score for the first time this season. It wasn't for lack of trying on both sides. Brendan Ranford hit a post with 4:41 left, and the 3-on-3 segment was especially electrifying as both teams had good chances. "3-on-3 is a crapshoot. You're trying to 2-on-1 guys all over the ice. We couldn't capitalize on it. For us, it's disheartening because we'd like to get an overtime win." Justin Dowling added, "[Overtime has] been our Achilles' heel this year. I thought we played well in overtime and well enough to win the game. We weren't super ready to go to a shootout today since we haven't been there in a while." Rookie Gemel Smith scored his sixth goal of the season in the game's opening minutes. It was his fourth career goal against Dan Ellis. Another rookie, Connor Brickley of San Antonio, would tie the game up off a point shot a few minutes later to set the score at tied after the first period. Brickley got a stick on Jonathan Racine's point shot to get the puck between Anders Lindback's pads. The Swedish tender kicked his skate in to attempt to cover the puck and knocked it into the net. The Rampage outshot Texas 17-16 in the period. Derek Hulak continued his emergence as a solid all-around player in the second period. With Travis Morin in the box for high-sticking, the rookie forward blocked three shots on the same shift to keep the San Antonio power play off the board. In the third, he added two more big blocks on the PK. 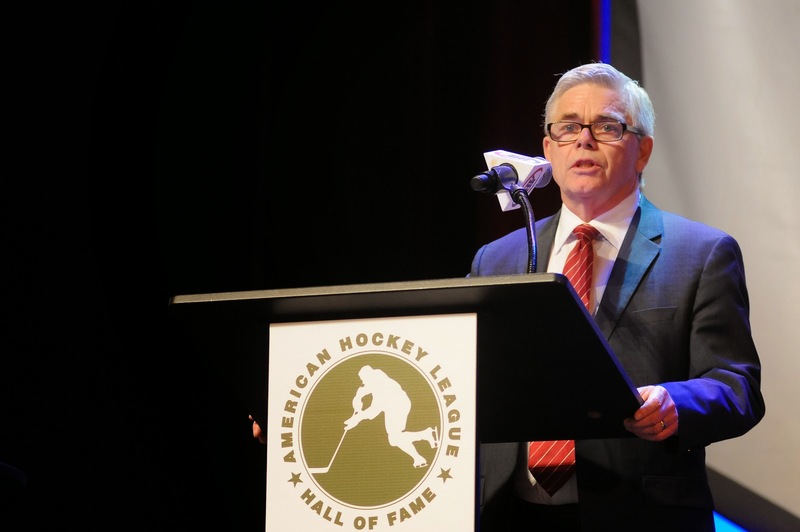 "We've been harping on shot blocking and Dallas is making us wear those shot blockers," said Dowling. "Even with them, Hulak was getting them in all the wrong places. He really put his body on the line and sacrificed a lot for us." Later in the period with Texas on a power play of its own, it was another rookie, Julius Honka, helping to generate the go-ahead goal for the Stars. With a nice keep at the right point, Honka got the puck down to Brendan Ranford on the man advantage. Ranford slid the pass out to Justin Dowling, who one-timed the puck by Ellis stick-side high. Hulak was at the net occupying a defenseman to boot. Rocco Grimaldi kicked off the third period with an unassisted tally. Overtime had been unkind to Texas this season and the team was hoping for a different fate. Coach Laxdal called the 3-on-3 segment a track meet. Further, he specifically called out a play where Shane O'Brien threw his stick at a puck to try and keep the puck away from a Stars' forward. "If you look at the overtime again," said Laxdal. "I don't know how a player can throw his stick on a puck and get away with it without a penalty call. That's a question for the league." In the shootout, Brendan Ranford was the only Stars' scorer. Vincent Trocheck and Rocco Grimaldi both scored five-hole on Lindback. All four Rampage goals in the game were scored five-hole. Texas now hits the road to play San Antonio on Thursday.